Everything you need to know to buy the right Peugeot 306 sports exhaust for your requirements. Includes reviews, exhaust noise videos and links to supplier websites. Buying a new exhaust system is an important decision which you should spend some time considering as it will make a huge difference to what the car is like to drive. I’m not talking about performance gains (we’ll get onto that later) but more about the noise levels you will be subjected to day in day out. It’s easy to think a loud exhaust will be great fun, but when you can’t have a regular conversation with your passengers at motorway speeds the novelty soon wears off. I’ve broken down the factors you need to consider before making your purchase. Probably the most important factor to consider when buying a sports exhaust for your 306 is the noise. The standard exhausts made by Peugeot are very quiet across all the engine ranges including the sportier XSi and GTi6 - if your standard exhaust is noisier than you think it should be the chances are it is either blowing somewhere and needs fixing or has been replaced with a cheap pattern part which are renowned for being poor quality, this is especially noticeable on the larger 1.8 and bigger engines. The noise any exhaust makes is determined by the material it is made of and the number of/properties of the exhaust mufflers. There are several types of mufflers but it’s not really important for this article. In an ideal world most people would want an exhaust which sounds almost standard on idle and driving around town / cruising at 80 70mph on the motorway but has a great sporty sound when you want to have some fun. Unfortunately in my experience such mythical properties do not exist and by fitting a sports exhaust you are going to have to relinquish some comfort. Just how much comfort you are about to part with is the tricky bit which is why i’ve added some videos at the bottom of this section. The main problem sports exhausts can suffer from is the dreaded ‘boom’, this is a low frequency noise which travels through everything and will quickly drive you insane. Most noticeable when the engine is under load or cruising at approximately 2500 - 3500rpm. Conveniently this rev range always seems to coincide with 60 or 70mph which makes motorway driving a pain in the arse. There is no way of finding whether you have a ‘boomer’ until it is on the car so the best thing to do is find someone who already has the system you are thinking of buying and going out for a drive with them to see if you feel it is acceptable. All UK tracks have noise limits which they must abide by. These noise limits vary from track to track but they are generally between 95db and 105db, generally your car will be tested with a decibel meter at a certain rpm and if it exceeds the set limit then you will not be allowed on track. As all Peugeot 306’s are only 4 cylinders under 2000cc most sports systems ‘should’ pass this however if you are running something horrendous there may be issues. If you are planning to use the car for track days definitely mention this to the sales person / exhaust fabricator when you are buying. The option of de-catting (replacing the catalytic converter with a silencer box or straight pipe) will of course result in your car failing to meet emission laws for driving on public roads and therefore illegal. If you are unlucky enough to be pulled over and subjected to a roadside emissions test you will fail and could get a fine or other some other inconvenience. You will also fail the MOT. The ‘benefits’ of fitting a de-cat are much debated amongst 306 owners - the exhaust will be noisier and there will be more pops and bangs caused by unburnt fuel igniting in the exhaust system. On the flip side some owners have reported removing the cat reduced mid-range torque (probably caused by upsetting the gas pulses / back pressure). Some owners who removed the cat but kept the standard Peugeot middle and back boxes have found this caused premature failure of the baffles as they are not designed to work under the extra stress caused by removing the cat. A collection of 306 sports exhaust noise videos from YouTube to give you an idea of how some of the popular systems can sound. The standard exhaust systems made by Peugeot have been designed to work with the engines to give good mid-range torque as this is where 95% of every day driving is done. As mentioned above some owners have reported a gain in top end power at the expense of reduced mid-range torque after fitting a sports exhaust. This is a choice you must make based on what you use the car for, if it is a weekend toy then losing some every day driveability is not an issue however if it is a daily driver then it might be more favourable to stick to standard. In reality I think any changes in performance will be almost unnoticeable on a standard engine and unless you have extensively modified it (e.g. longer duration cams and individual throttle bodies) there will be minimal performance benefits from fitting a sports exhaust. 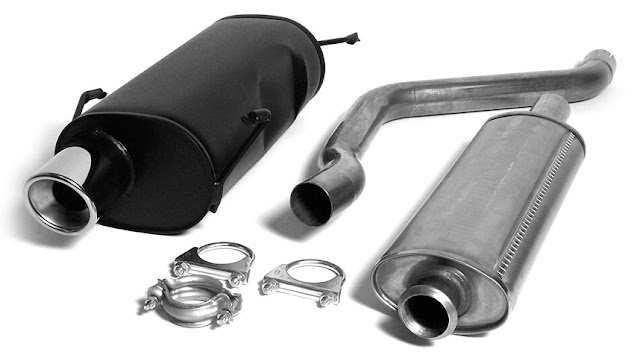 The price of a sports exhaust will vary from around £50 for a replacement rear box to £500+ for a custom stainless full system from the manifold all the way back. “Cat-back” systems are the most popular which consist of a middle box and rear box and can generally be bought for £250 - £400. Pretty much all aftermarket sports exhausts are made of stainless steel. The exact grade of stainless steel may vary but apparently T304 is the best in terms of longevity. Some fabricators will offer a lifetime guarantee on their exhausts which is also something to bare in mind. Due to the popularity of the 306, there are a wide range of off the shelf systems available to suit all tastes. One system which is very popular amongst those who prefer a more refined sound is the Jetex, this system has a good reputation on owners clubs for being almost as quiet as standard as well as not looking too "boyracerish". A benefit of going to a custom exhaust fitters such as Longlife or Maniflow is that you have the choice to specify how loud you want the system to be and (in theory) the fit should be perfect. Bought a 306 performance exhaust? Leave a comment below and let us know what you think of it. Does anyone know what a standard decibel reading is for 306 gti 6 exhaust is as I cant find it anywhere.